Although Jos. 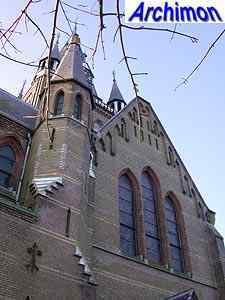 Cuypers designed his first work, a house in Amsterdam, in 1884, and he had cooperated with his father for several years, it lasted until 1889 before he designed the first church under his own name. 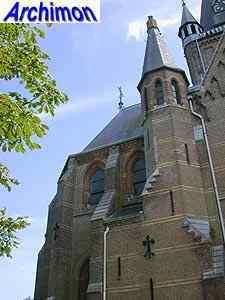 This St. Urbanus is a three-aisled cruciform basilica. The traves of the side-aisles each have a gable to allow for larger windows than otherwise would have been possible. The windows in the clerestorey are smaller. At the front northern side-aisle ends with a polygonal baptistry. 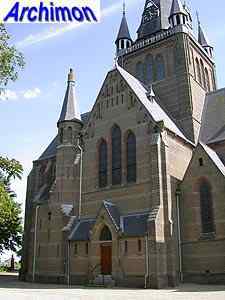 As could be expected, and probably even was expected from the architect, the design owed much to the work of P.J.H. 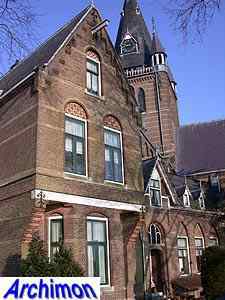 Cuypers, Jos.' famous father. 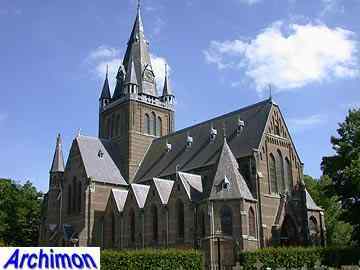 Its neo-Gothic style resembles much of that of Cuypers Sr. work at that time, although Jos. Cuypers might have been partly responsible for that style himself. But instead of just taking elements of his father's work and combining them, Jos. added a few new elements of his own. 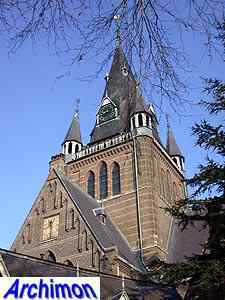 The square crossing-tower immediately comes to mind, which reminds of that of the St. Augustinus in Nijmegen (1884-1886, destroyed 1944). 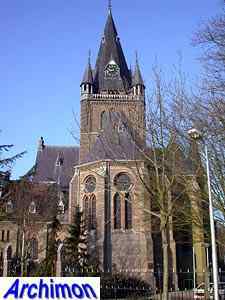 But unlike previous towers here the spire rests on a low octagonal element instead of directly on the square tower. A second reference to P.J.H. 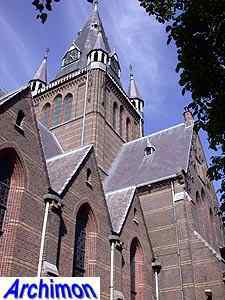 Cuypers' work are the triplet-windows of the front and the transept. 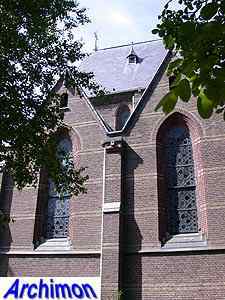 Cuypers Sr. used similar windows often in the 1860's and -70's. 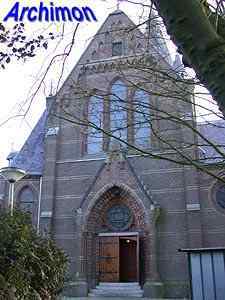 After this church they fequently returned in the churches of the Cuypers-office. 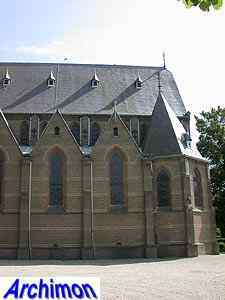 The closure of the choir features another combination of windows that P.J.H. 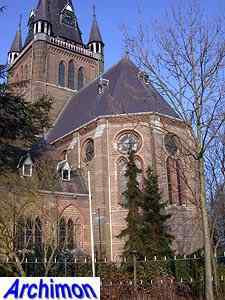 Cuypers had previously used, like at the St. Catharina in Eindhoven, being two narrow lancet-windows with a circular window above them. Cuypers Sr. hadn't used this combination for a long time, but Jos. 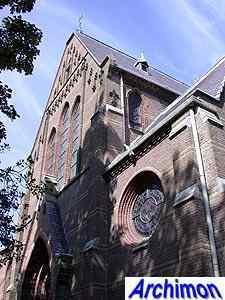 later uses them again for his St. Bavo cathedral in Haarlem. Like many of P.J.H. 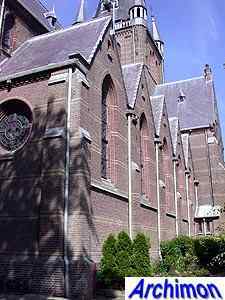 Cuypers' churches a horizontal accent is provided with the use of lines of differently coloured bricks in the walls. 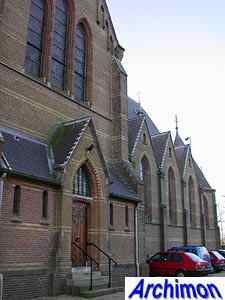 In the interior bricks of different colours were also used, one of the first times this was done in The Netherlands. Another important element of the interior is the location of the singers-tribune, which is positioned between transept and choir, instead of the much more usual position in the western part of the church. Pictures of the interior can be seen on the next page. Many other details show that Jos. Cuypers had not yet developed a style of his own. It would take another several years before he did. 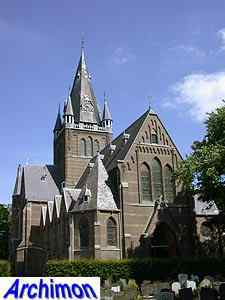 After the St. Urbanus he gradually added more elements of his own in his designs, while continuing to use elements from his father's work for some time.